People flee the scene of an explosion on the pedestrian Istiklal avenue in Istanbul, Turkey, on March 19, 2016. Two Americans were among the people killed when a suicide attacker denoted a bomb in a popular shopping district of Istanbul, Turkey, on Saturday, according to the White House, NBC News reported. The State Department identified the dead Americans as Yonathan Suher and Avraham Goldman. The White House said they were among the five reported fatalities. Health Minister Mehmet Muezzinoglu confirmed that at least 39 people had been wounded and seven of those were in serious condition. Twenty-four of the wounded were foreigners, he said. A spokesman for the Israeli Foreign Ministry earlier said 10 Israelis were among the wounded and at least 10 were still missing. 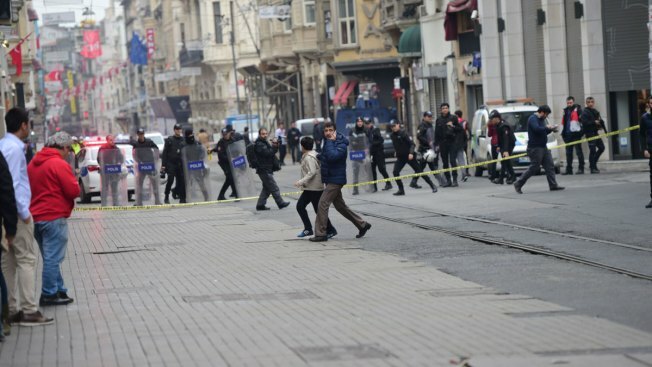 Preliminary findings indicate that the outlawed Kurdistan Workers Party (PKK) or an affiliate carried out the attack, a senior Turkish official told Reuters.